Lock in a great price for Crowne Plaza Panama – rated 8.4 by recent guests! Professional and helpful staff. Immediately responded to any issue addressed. Nice and clean all amenities were above par! Easy access in the city for in and out! In the town of Ciudad of Panama, have a lot of restaurants near. Proper hotel for the City Visitor. Access to everything. Super staff. But in the City. So for going out it is good, but no nature, quiet, or calm. Hotel is decent value for money if you need to be in City. The Location is close to Metro. The staff at reception are very kind and supportive. The WiFi is very good. Crowne Plaza Panama This rating is a reflection of how the property compares to the industry standard when it comes to price, facilities and services available. It's based on a self-evaluation by the property. Use this rating to help choose your stay! 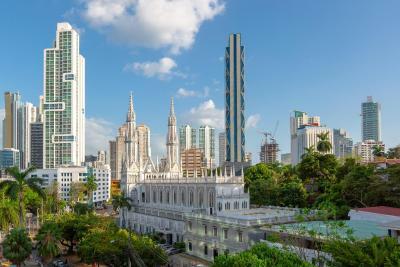 Crowne Plaza is located in the Financial District of Panama City and a short distance from restaurants and shops. It offers a 24-hour fitness center, outdoor pool and a business center plus meeting facilities. The fresh-decorated rooms and suites are air conditioned and offer ironing appliances, working desks and a coffee maker. Flat-screen cable TV, a mini bar and a hairdryer are also in-room amenities. The bathrooms are private and provide free toiletries. The Crown Plaza Panama's on-site restaurant is specialized in characteristic Panamanian dishes and features a lunch buffet. The Cocktail Lounge offers the guests a variety of drinks. Located on Manuel Espino Batista Avenue, Crown Plaza Panama is 10 minutes’ drive from the Historic Center and the Panama Channel Museum. When would you like to stay at Crowne Plaza Panama? Depending on availability, these rooms may feature a king-sized bed or 2 queen-sized beds. The smoking preferences cannot be guaranteed and will be allocated upon the guest's arrival. Featuring a 32" flat-screen cable TV, mini-bar and a coffee maker, this king room offers air conditioning, a safety deposit box and ironing appliances. These rooms enable the guests to access into the Executive Lounge, which offers Concierge services and a 32" flat-screen cable TV. The lounge also features complimentary dinner snacks, drinks, and Continental breakfast. Morning newspaper will be delivered at the door. Featuring a 32" flat-screen cable TV, a mini bar, coffee maker and and radio, these rooms offer air conditioning, wardrobes and spacious working desks. These rooms have state of the art amenities like a 32" flat-screen cable TV, pillow menu, eye masks and a fully stocked mini-bar for the guest's enjoyment. Featuring a 32" flat-screen cable TV, mini-bar and a coffee maker, this king room offers air conditioning, a safety deposit box and ironing appliances. The bathroom comes with a tub and a hairdryer. These rooms enable the guests to access into the Executive Lounge, which offers Concierge services and a 32" flat-screen cable TV. The lounge also features complimentary dinner snacks, drinks, and Continental breakfast. Eye masks and soothing lavender spray will be provided to enhance the guest's rest. Featuring a separate seating area and a 32" flat-screen cable TV, these suites offer en-suite amenities like a pillow menu to provide the best comfort, bathrobes, a mini bar, coffee maker and morning newspaper delivery. Complimentary Continental breakfast, dinner snacks and drinks are provided. Featuring a separate seating area and an equipped kitchenette, these suites have amenities like a 32" flat-screen cable TV, earplugs and pillow menu to provide the best comfort. Bathrobes, a mini bar, coffee maker and morning newspaper delivery are also available. House Rules Crowne Plaza Panama takes special requests – add in the next step! Crowne Plaza Panama accepts these cards and reserves the right to temporarily hold an amount prior to arrival. Air conditioner not working properly. That we had to leave and come home. Water was only warm enough to shower never hot enough for a bath. The rooms and the general areas very tired, needs updating. We moved rooms twoce, the second room had a big patch of damp with crumbling plaster. Breakfast was hit and miss, more like a dinner meal most mornings. Expensive for what it is. Was a very good Breakfast as is.